Bright meteor from the 2016 Perseid Meteor shower. 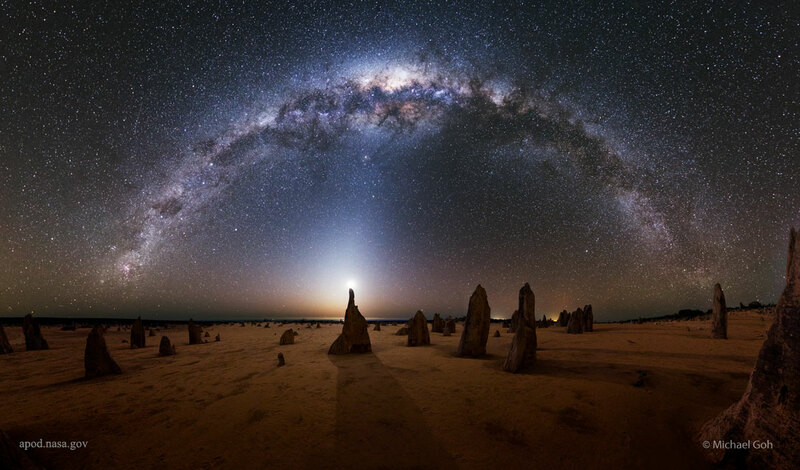 Taken in Nambung National Park in Western Australia, a crescent moon appears to balance on one of the Pinnacles- an unusual, human-sized rock made of limestone. The glow surrounding the Moon is due to zodiacal light, when sunlight reflects off dust particles found between planets in the solar system. The central part of the Milky Way arches over the horizon, completing this wonderfully unique composition. 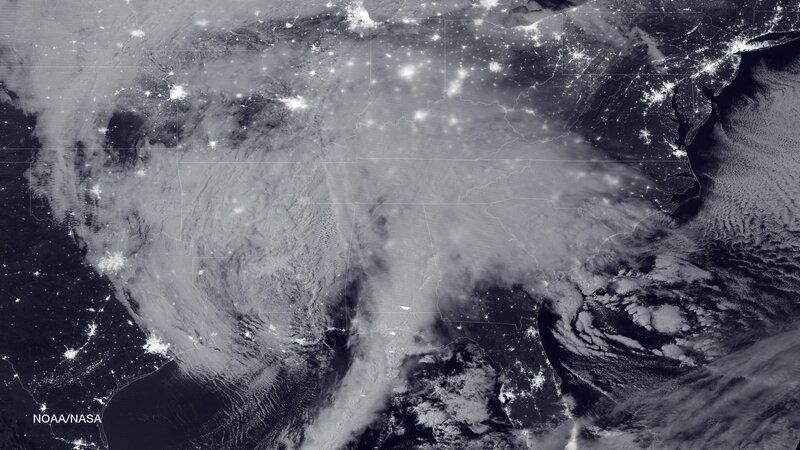 Today, the east coast of the US faces winter storm Jonas, the first blizzard of the season. 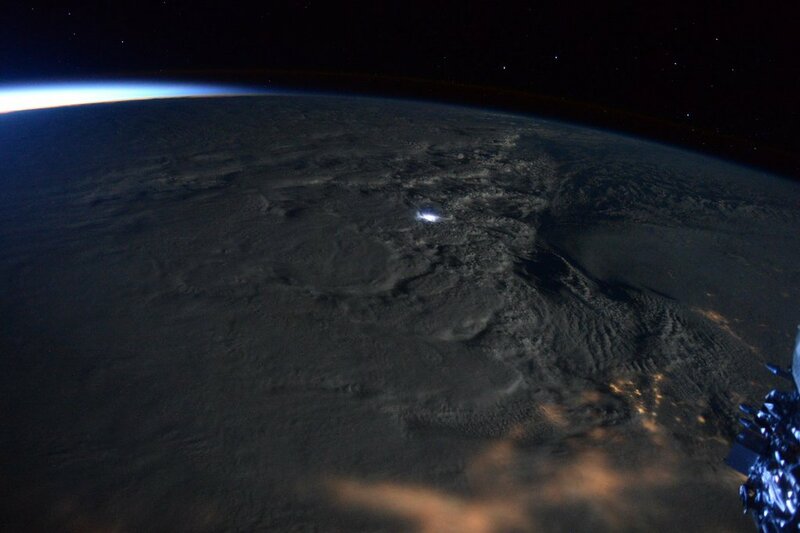 Observing from many miles above, astronaut Scott Kelly snapshotted a rare instance of “thundersnow”- when it snows during a thunderstorm instead of rain- piercing through the thick cloud cover. Every gas-giant planet in our solar system contains a ring system, which are billions of ice and dust particles orbiting around a body in space. Saturn’s iconic ring system is one of the most notable and breathtaking. Kevin Gill, a software engineer who performs science data visualizations for NASA’s Jet Propulsion Laboratory, set out to create visualizations to aid in speculation as to what a ring system would look like orbiting Earth. 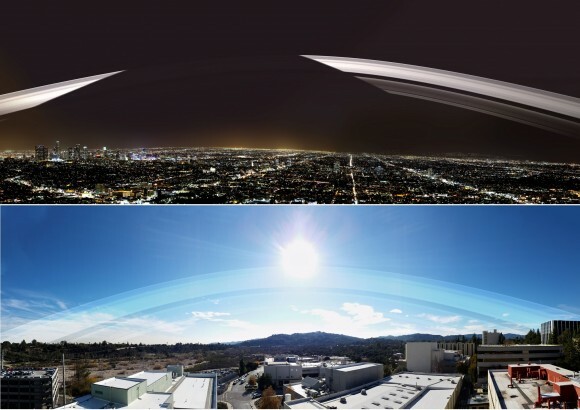 The three photos shown above are, in order form top to bottom, of New Hampshire at night, Los Angeles at night, and Pasadena, California midday. 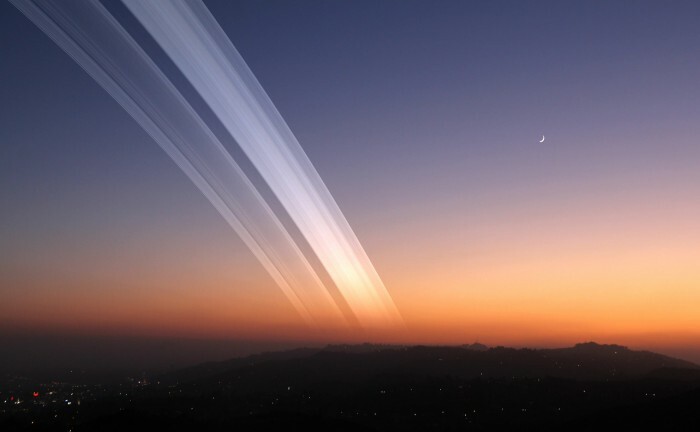 Using vacation photos, Photoshop, and other softwares, Gill edited the images to create a realistic view of how a ring system would alter our view of the sky. If you’re having a rough day, this astrophotography is sure to turn that frown upside-down. 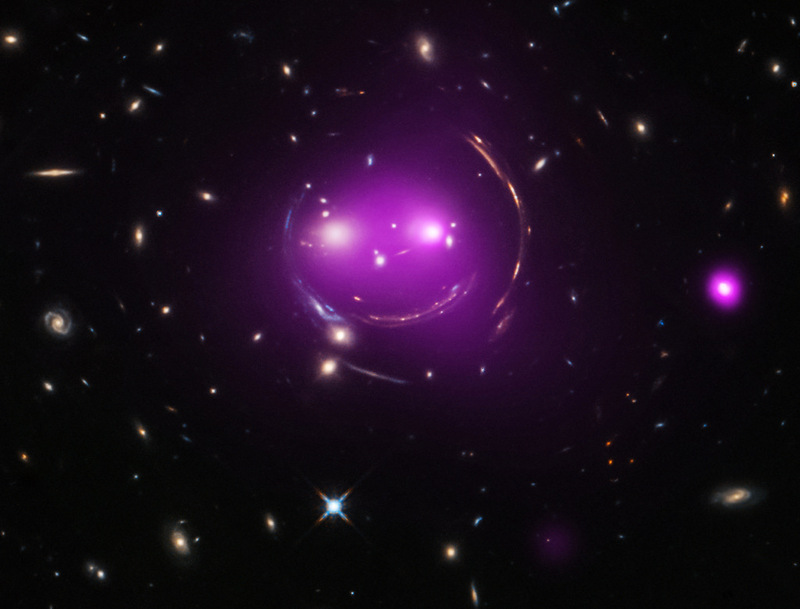 The galactic group, known as the Cheshire Cat, is located in the constellation Ursa Major around 4.6 billion light-years away. 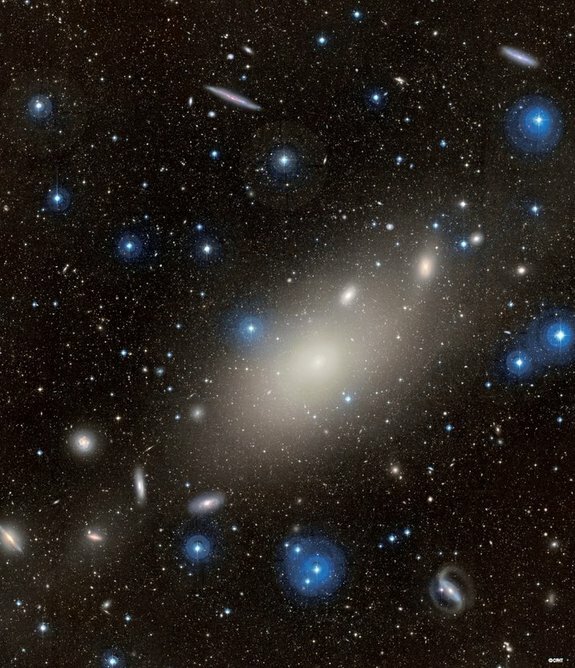 The galaxies appear warped due to gravitational lensing, a phenomena caused by the galactic group’s total distribution of gravitational mass and its interaction with dark matter. VV 340 represents a cosmic collision of immense proportions. The topmost galaxy, VV 340 North, and the front-facing galaxy, VV 340 South, are together known as the “Cosmic Explanation Point”. The title complements their destiny. 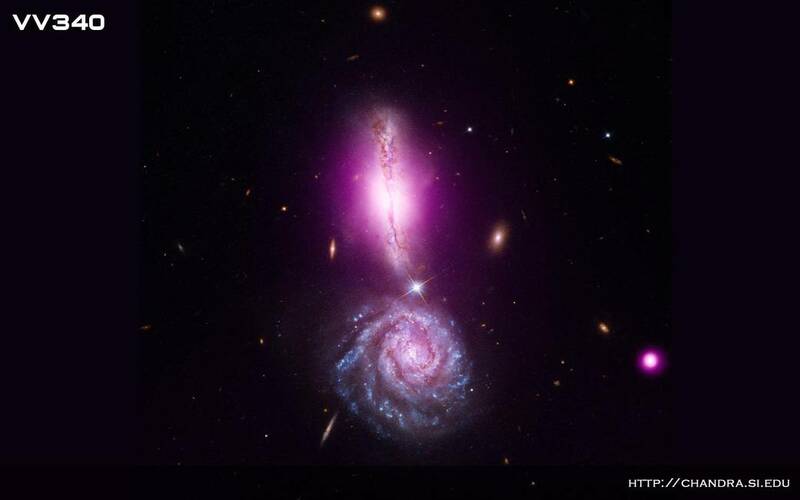 In millions of years, the two spiral galaxies will collide and eventually merge into one super galaxy. When galaxies collide, the event is more peaceful than it sounds. Due to the high gravitational pull from all the cosmic bodies within a galaxy, much of the internal workings, such as stars and planets, remain intact. Occasionally, stars go rouge and are propelled from their galaxy as a result of a collision, but almost never do stars actually collide. Although galaxies are filled with stars, they are spread very far apart from each other, making the possibility for stars to collide during galactic merging next to zero. 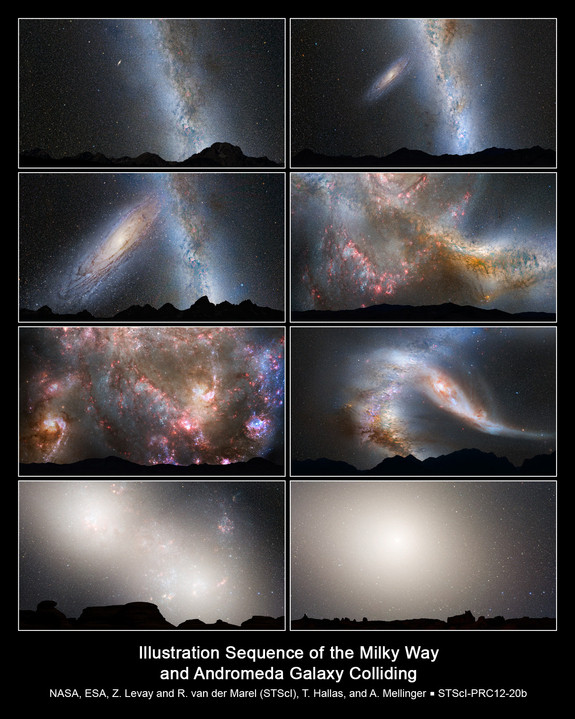 That’s lucky for us, since in a few billion years, the Milky Way will collide with our neighboring galaxy, Andromeda. The Hubble Space Telescope captures a “cosmic couple” as a star named Hen 2-427 and the surrounding nebula M1-67 make for a marvelous photograph. The pair can be found in the constellation Sagittarius. A nebula acts as a nursery for star formation, composed of hot gases and dust. 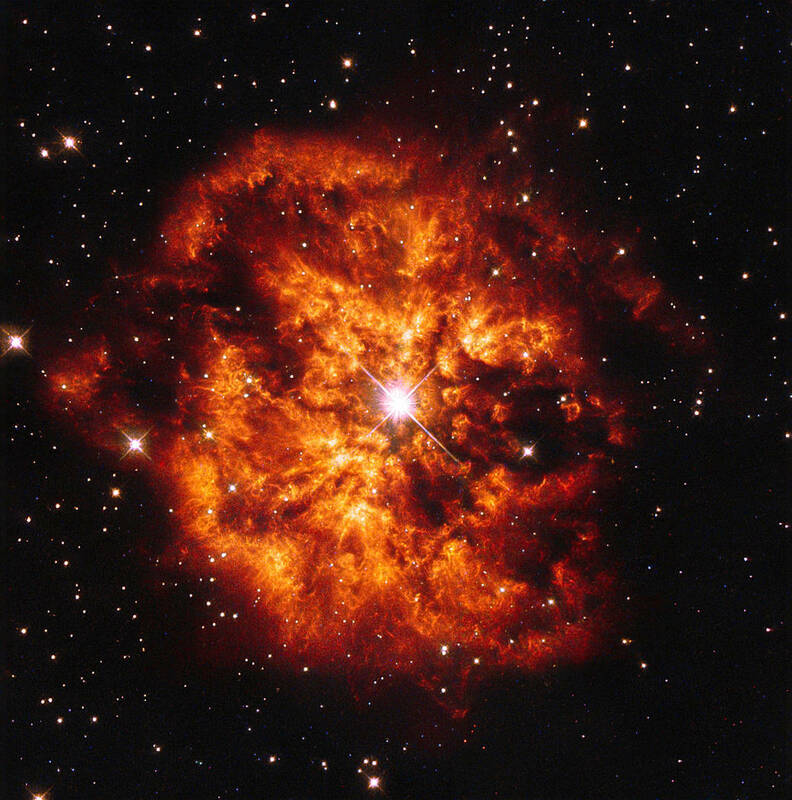 The ingredients of a nebula generally come from the death of another star. So even in death, the legacy of a star is passed on to the next generation. M1-67 is approximately 10,000 years old; a newborn in the cosmic timeline of our universe. To put it into perspective, the Earth is nearly 4.5 billion years old, and the human race is about 200,000 years old. 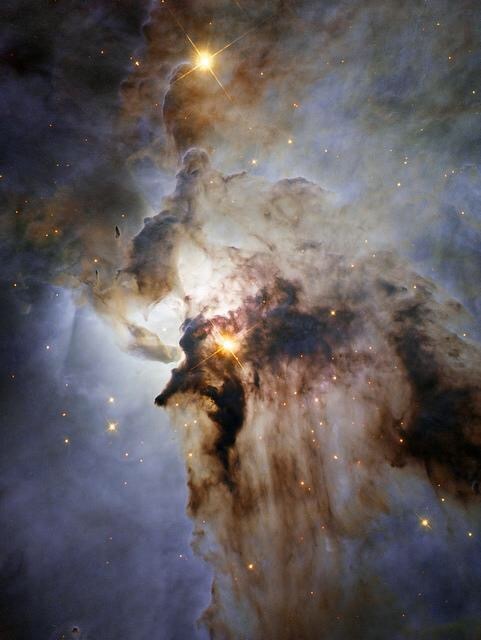 This nebula formed during the time of our distant ancestors. 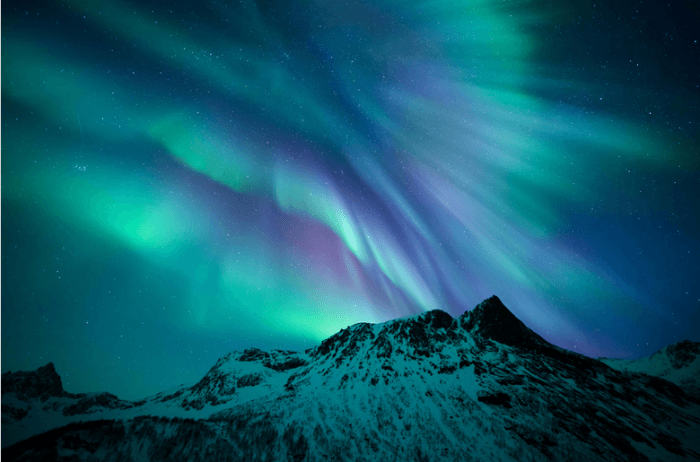 A splendid display of the aurora borealis, better known as the northern lights, above the mountains of Senja, an island off the coast of Norway. Electrically charged particles emitted from the Sun cause the vibrant hues of green, blue, and purple. The color variations depend on the element reacting with the charged particles. The most common color observed, green, is caused by the atomic oxygen molecules about 60 miles above the Earth. The purple and blue hues come from reactions with atmospheric nitrogen. 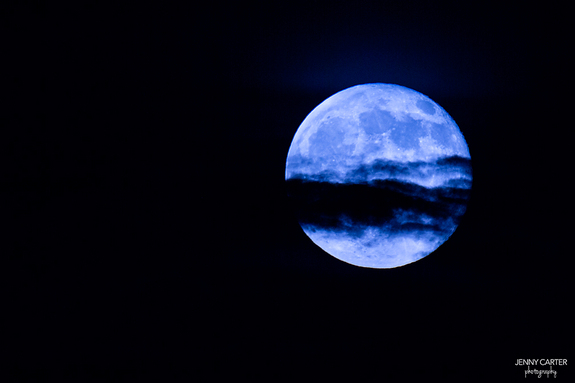 The phrase “once in a blue moon” actually refers to the astronomical event of two full moons occurring in the same month. 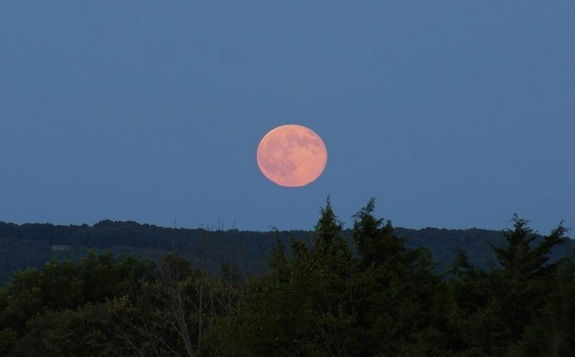 These photos via Space.com capture the second full moon during this July. The next time a blue rises will be in 2018. 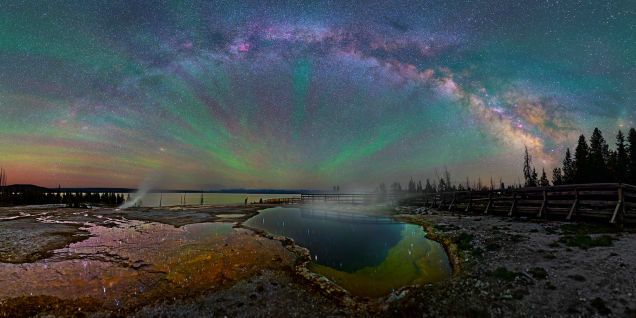 These series of images taken in Yellowstone National Park express the vibrance held within the night sky. 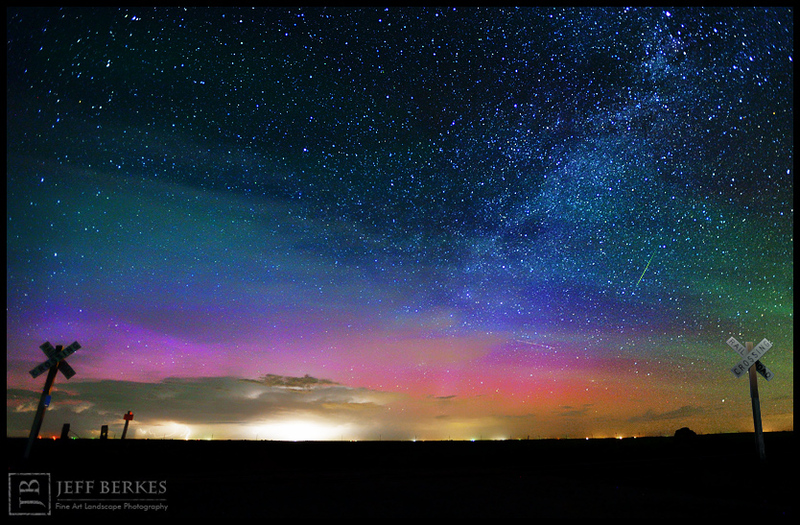 Photographer Dave Lane captured the Milky Way just after a storm passed through. The water vapor from the body of water in the lower photo almost appears to feed into the heart of the galaxy. Undeniable a phenomenal set of photographs. 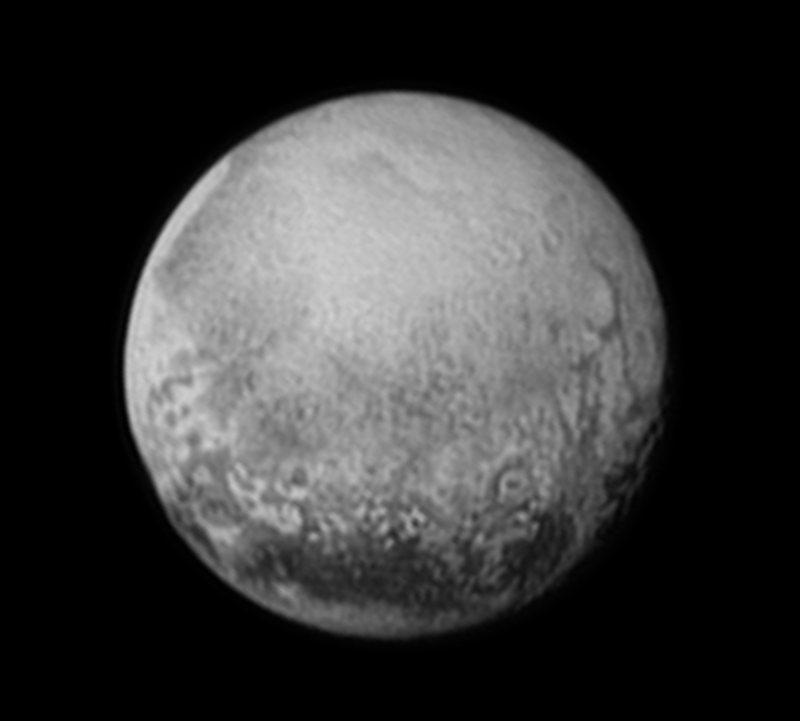 Pluto becomes more fascinating with each discovery the New Horizons mission unveils. These images taken July 11th are the clearest yet of the icy dwarf. 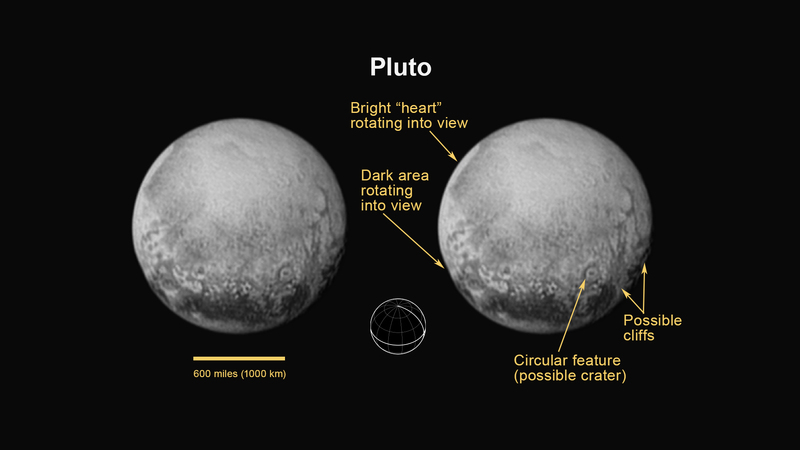 Turns out Pluto may be more complex than previously suspected, with massive cliffs and craters scattering the surface. More information will be collected as the monumental flyby date approaches, July 14th (tomorrow) at 7:49 AM EDT. 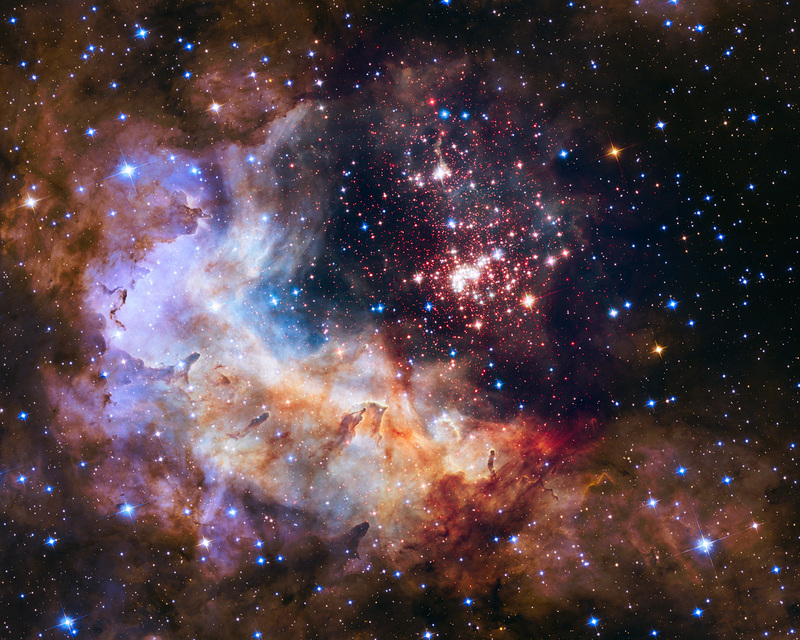 Another stunning photo by the Hubble Space Telescope captures the immense beauty of the Westerlund cluster. This image honors the 25th anniversary of the Hubble and featured alongside the countless other images taken by the telescope that have shaped how we view our universe. This is no ordinary photo of our moon. 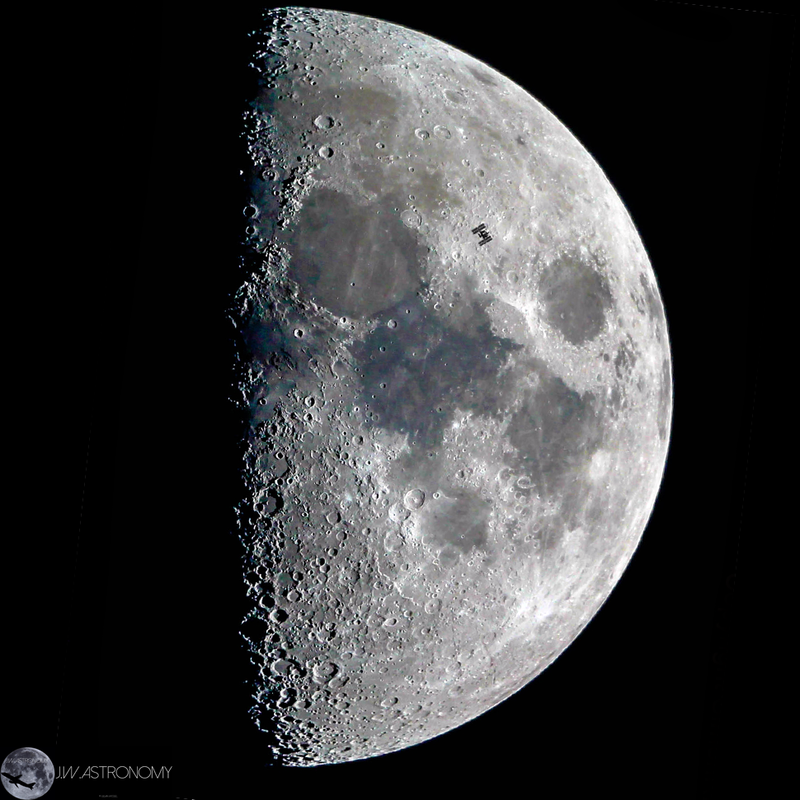 If you look closely, the International Space Station flies by in contrast to the lunar surface. Talk about great timing! An iconic Hubble discovery, this beautiful infrared imaging of the Horsehead Nebula creates a striking contrast between the backdrop of space, settling many eyes into a state of awe. 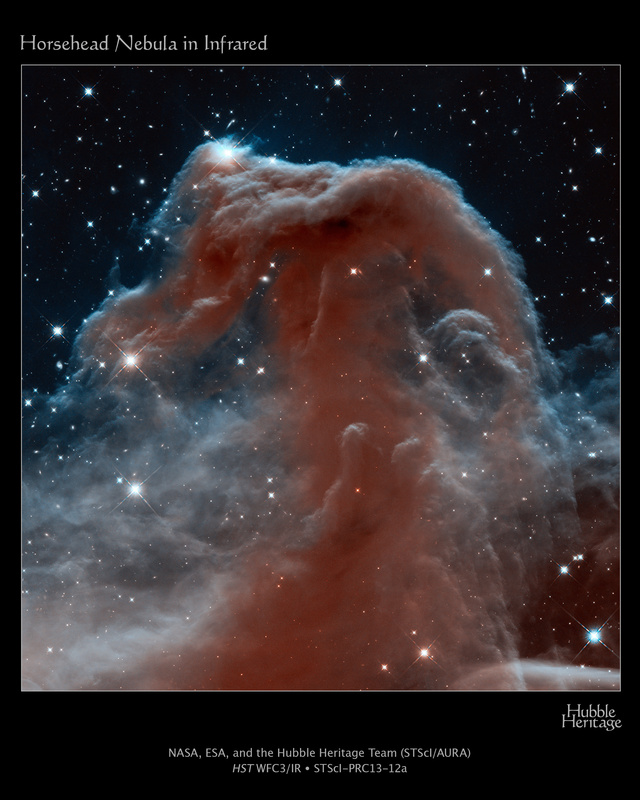 From perpetrating light of stars surrounding the “horsehead” region, astronomers estimate the nebula has about five million years before it disintegrates. The nebula is found in the constellation Orion. 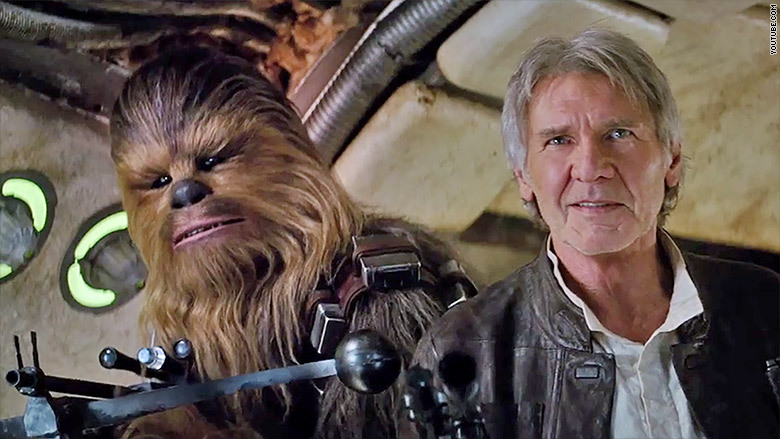 This media commemorates the release of the new Star Wars: The Force Awakens trailer! I don’t know about you, but my heart flutters every time I watch it. It ignites placid childhood memories of idolizing the franchise and how it intertwines with science, history, and literature. This beautiful panoramic of the Milky Way arching over Loon Island Lighthouse in New Hampshire was photographed by A. Garrett Evans. In an email to Space.com, he expressed the complexity behind this particular photo. 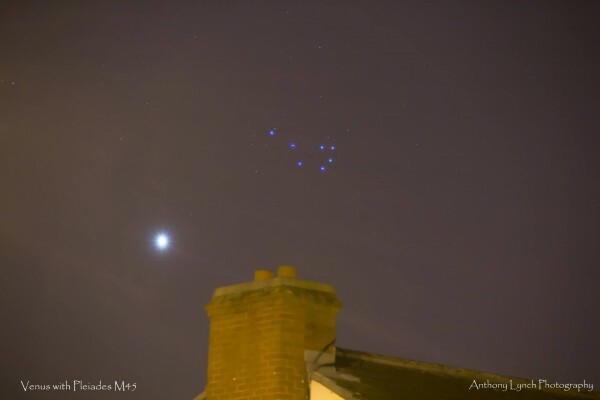 Today three majestic images will be featured in honor of the Venus and Pleiades cluster alignment, which happens once every eight years. 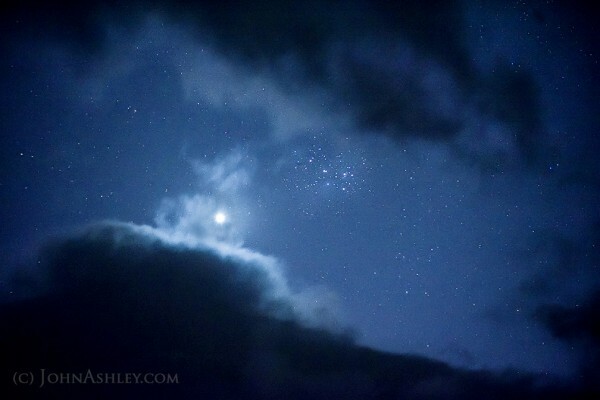 This first photo shows Venus and the Pleiades peeking out from a cloudy night, photographed by John Ashley. The striking blue tones of the brightest stars in the Pleiades cluster are very evident in this photo by Anthony Lynch. 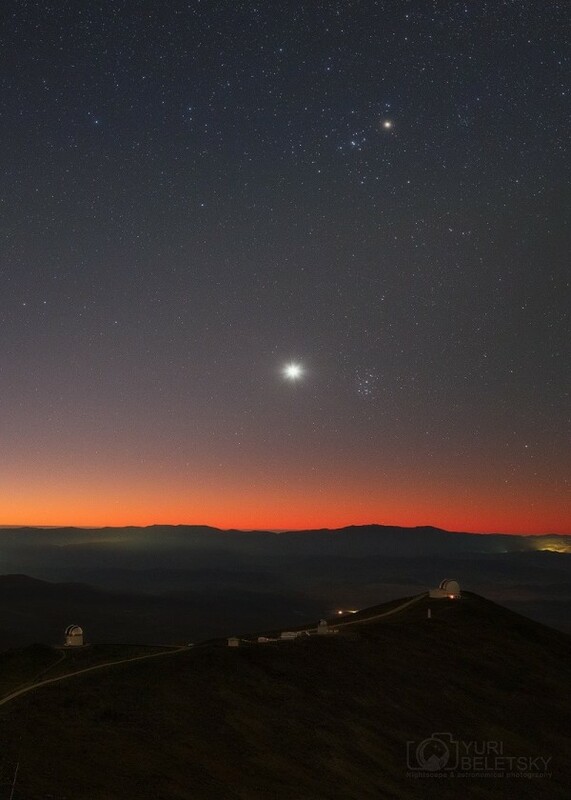 Lastly, this photo taken by Yuri Beletsky shows an beautiful big sky perspective on the bright Venus and Pleiades. To learn more about the alignment of these two celestial objects, check out the corresponding post in the Astronomical Calendar! 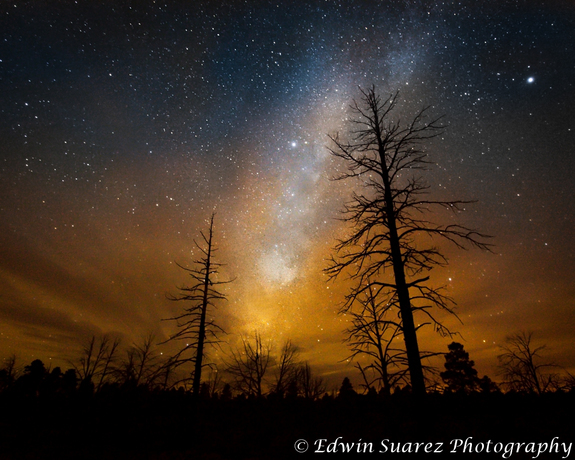 Let your eyes feast upon this beautiful image of the Milky Way over the Grand Canyon by Edwin Suarez. The orange tones near the horizon make for a poetic forest fire-like landscape. 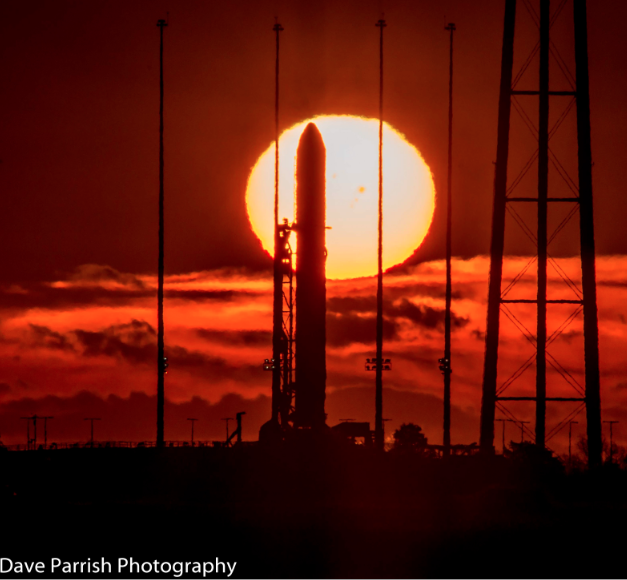 This isn’t just any ordinary astronomical photo ladies and gentlemen. Taken by Jeff Berkes in 2013, this image captures the Milky Way, a Bootid meteor, the northern lights, AND a lightening storm. Talk about being in the right place at the right time! 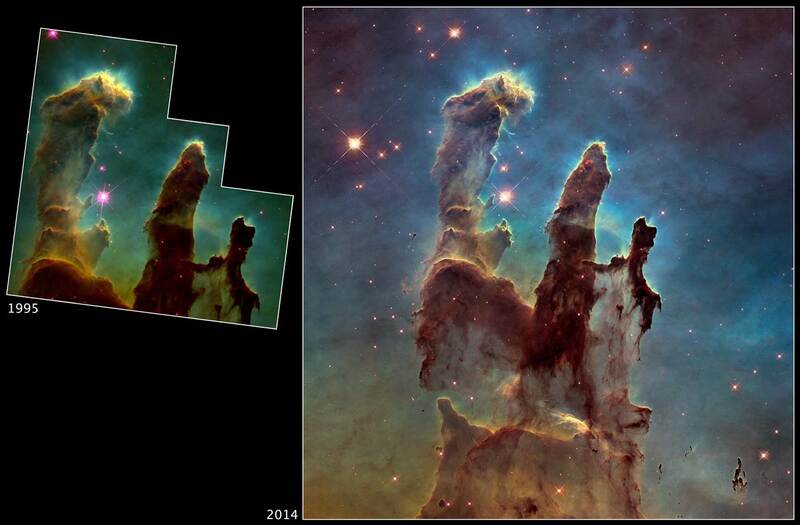 Nasa is celebrating the upcoming 25th anniversary of the Hubble Space Telescope by releasing this new, updated image of the Pillars of Creation in the Eagle Nebula. The pillars have drastically changed over the past 20 years. Though difficult to even notice, one of the pillars has been moving 450,000 miles per hour, traveling a total of nearly 60 billion miles! 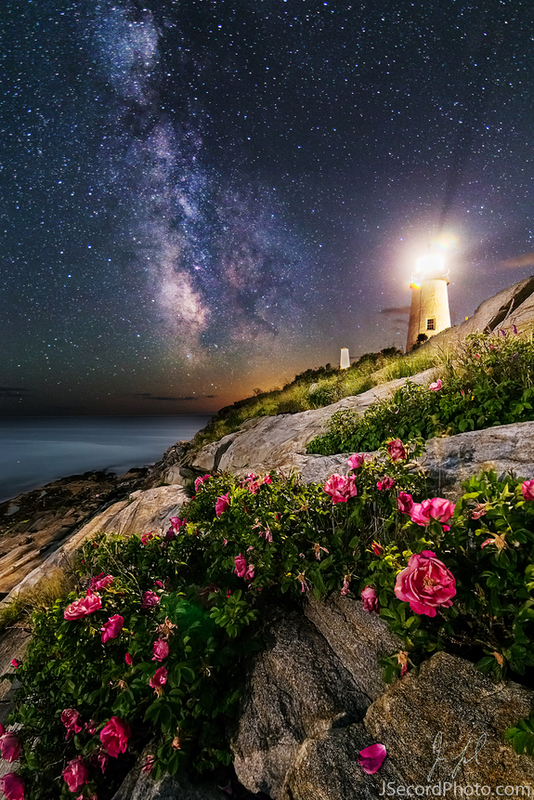 This beautiful photo was taken by Jon Secord in Pemaquid, Maine. Not only does the Milky Way look astounding, but also the moon aligned perfectly behind the lighthouse to create the illusion that it is lit. 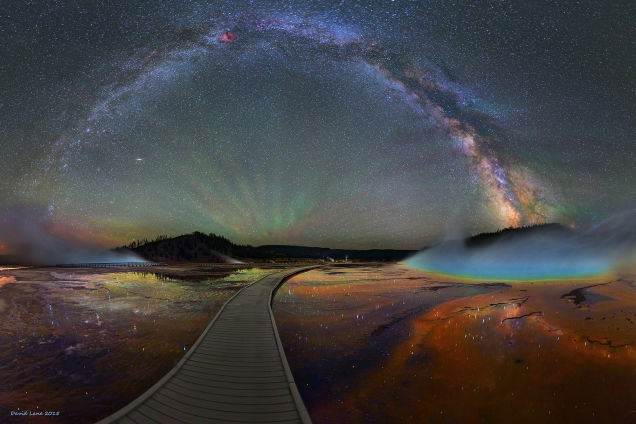 Truly a colorful and magnificent display of astrophotography! 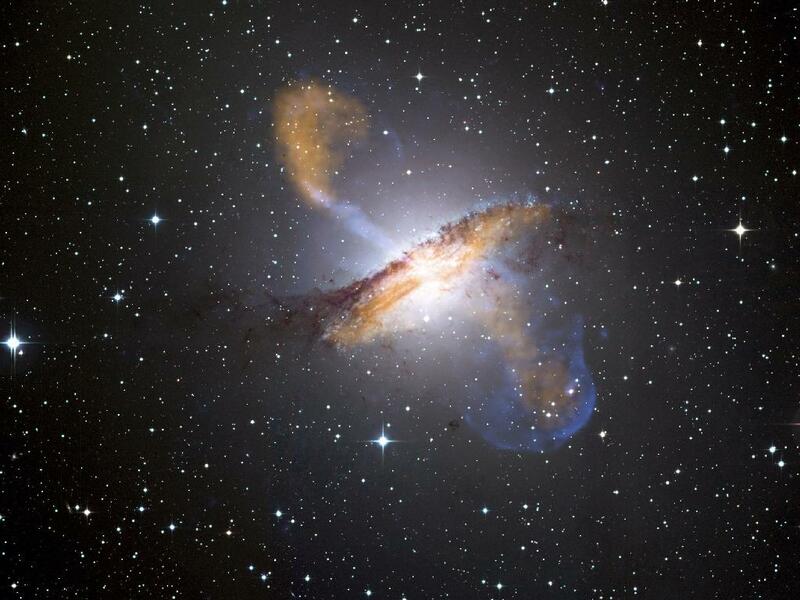 This is a stunning image of the galaxy Centaurus A. At nearly 12 million light years away, the closet active galaxy to our own. The jet waves being propelled into space are caused by the activity of the supermassive black hole at the galaxy’s center. Due to the jet waves, immense amounts of X-rays and radio waves are released from Centaurus A every second… Don’t want to get too close to that! 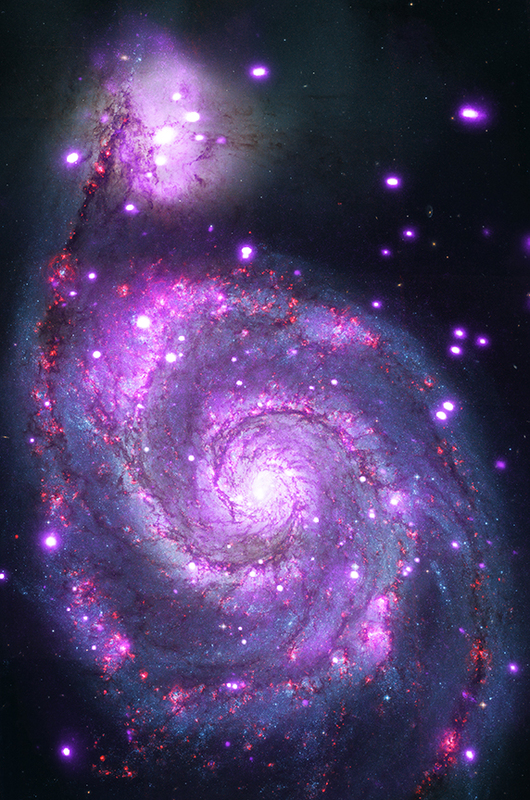 Courtesy of the Chandra Observatory, astronomers can view the Whirlpool Galaxy (M51) in spectacular colors. This composite image uses optical data from the Hubble Space Telescope shown through the reds, blues, and greens. Chandra detects the bright purples. The spectacular spheres of purple reveal high energy X-ray sources such as X-ray binaries (XRBs), which are binary star systems where one star in the system (either a neutron star or black hole) is capturing material from its companion. Through studying M51 for over a decade, astronomers believe there are around eight black holes eating material from their companion stars. The Whirlpool Galaxy is a Spiral Galaxy similar to the Milky Way. However, unlike the Milky Way, M51 is merging with a companion galaxy as shown in the upper portion of the photograph. When two galaxies merge, the gas and dust within their arms heat up and create the beautiful, luminous colors reflected in this photo! Just yesterday, NASA released this delightful photo of globular cluster NGC 121, which is located in a nearby galaxy known as the Small Magnetic Cloud (SMC). 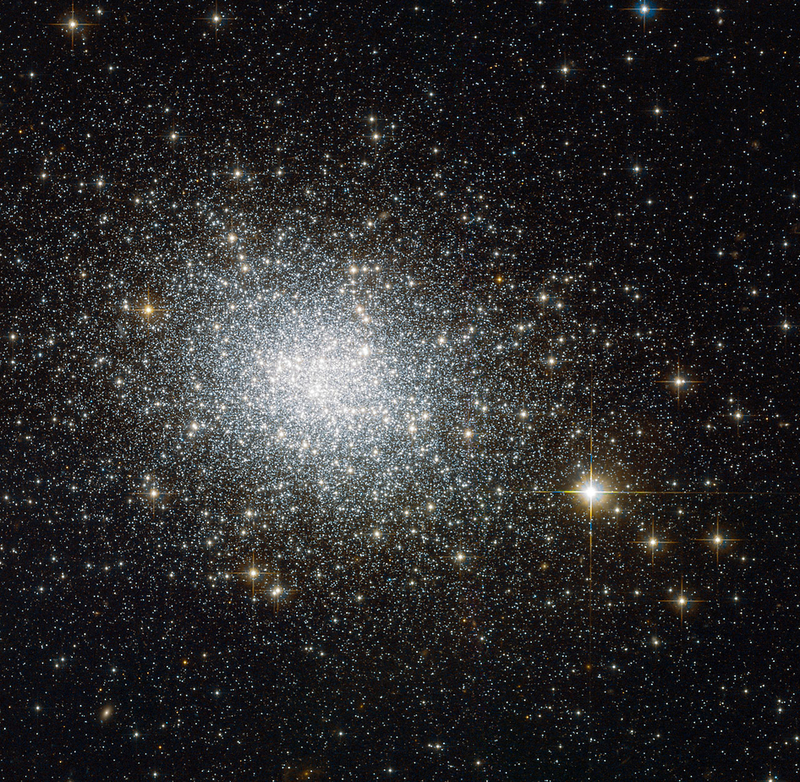 This globular cluster is the oldest in the SMC, nearly 10 billion years old! That makes this photo (taken by the Hubble Space Telescope) the oldest evidence from the galaxy. 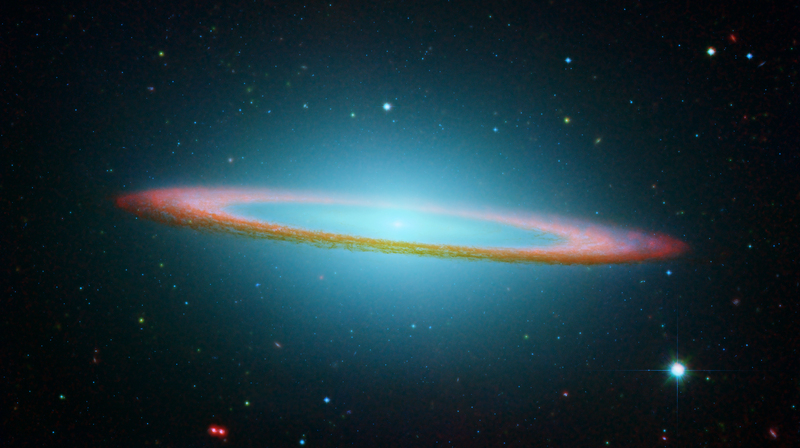 This beautiful photo of the Sombrero Galaxy shows the different colors detected from the galaxy. This galaxy is a favorite amongst astronomy enthusiasts. 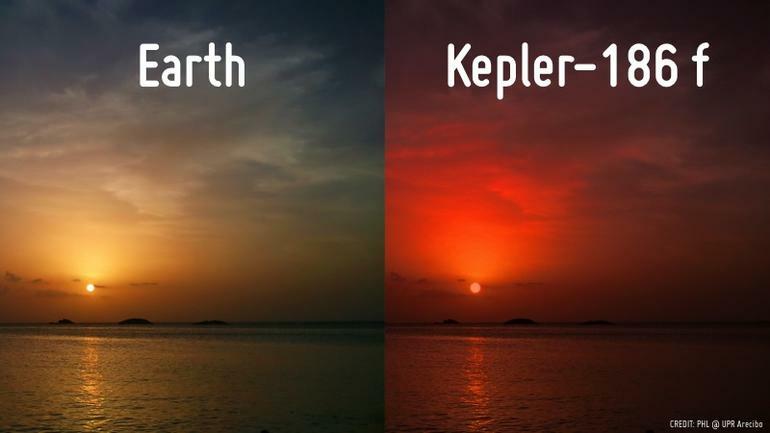 A beautiful predicted comparison of a sunset from earth vs. and sunset from Kepler-186f, the “sister earth”. The reason why the atmosphere has a redder tone on Kepler-186f is due to the fact that it orbits a red dwarf star. With summer approaching, the glorious Summer Triangle will soon begin to rise in the northern hemisphere! 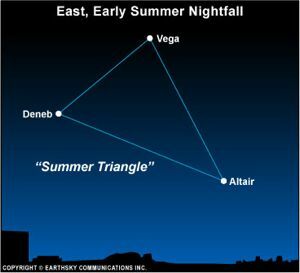 One of the most identifiable constellations in the night sky, the Summer Triangle contains three beautiful stars, Deneb (the brightest star in the constellation Cygnus), Altair, and Vega. During the peak of summer, Vega is directly overhead and the entire constellation is very easy to find. 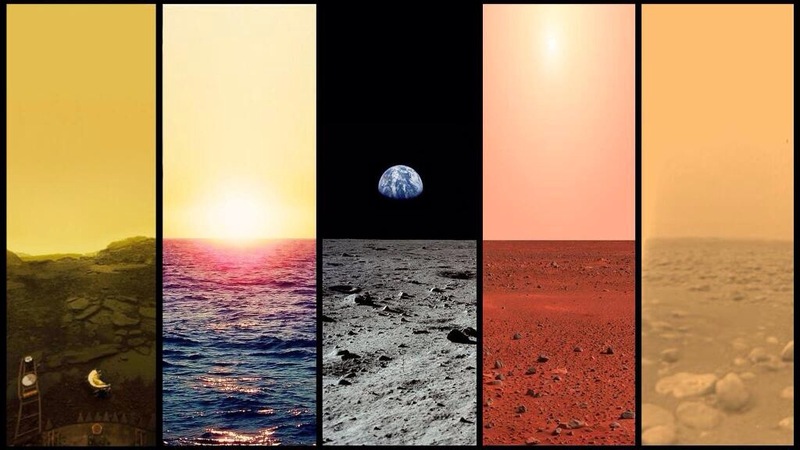 A truly awesome image reflecting the different horizons of the solar system. The plains from left to right are Venus, Earth, the Moon, Mars, and Titan. Hopefully one day we will receive actual images of the horizons of Titan and Venus! A diagram depicting the pending doom for the Milky Way Galaxy as it collides with our neighbor, the Andromeda Galaxy. But don’t worry, this won’t happen for at least another 3 billion years! Both the galaxies are currently known as “barred spiral galaxies”. However, once the two merge, they will create one “elliptical galaxy”. Anyone who watches COSMOS is familiar with this planetary nebula as it is part of the program’s logo. But do you know what it is called? 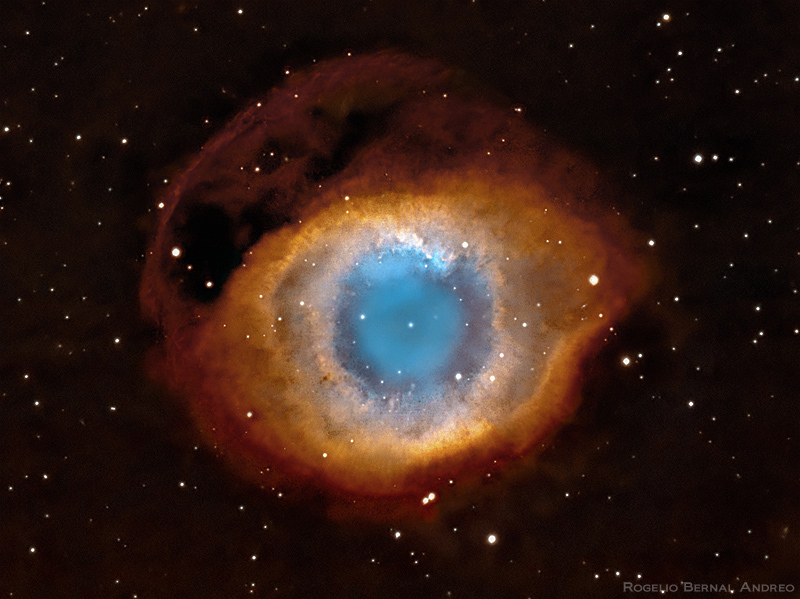 It goes by two names, the Helix Nebula or the Eye of God. 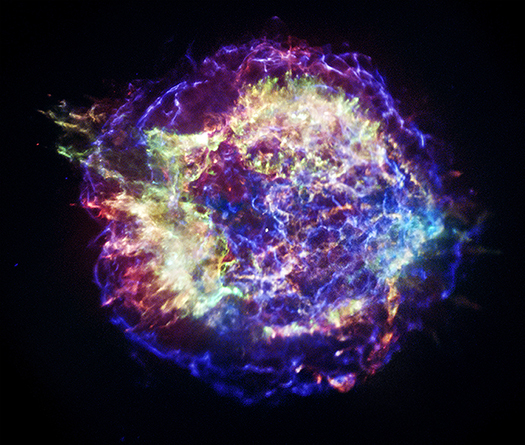 Remains of a supernova form this colorfully inspiring image captured by NASA’s Chandra X-Ray Observatory. 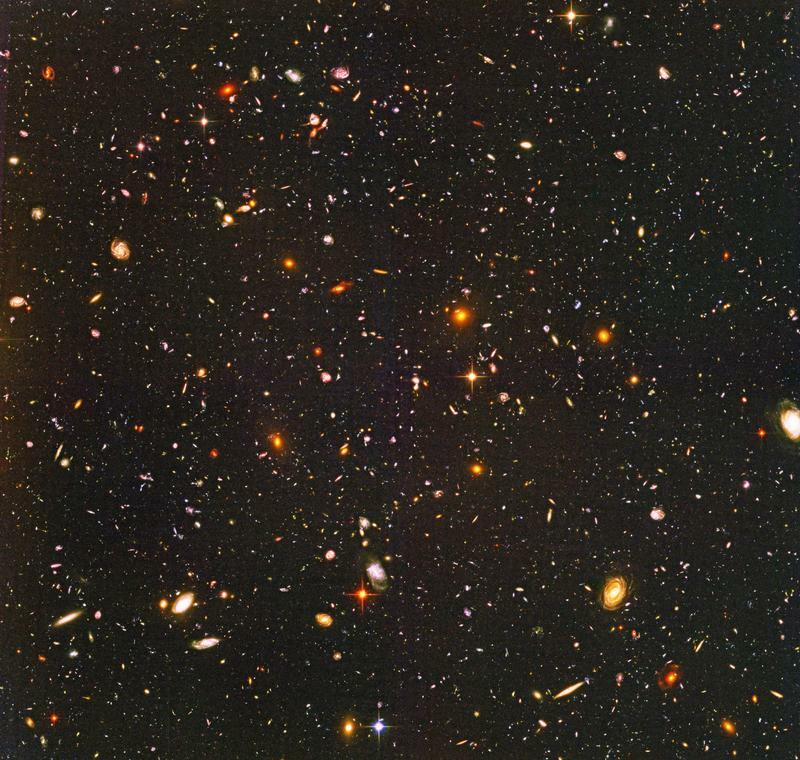 This incredible photo courtesy of Hubble Deep Field really paints a picture as to how small we are in the immensity of our universe. See every little dot? They are all galaxies just like our own, each with millions upon millions of stars… Who knows, maybe one hosts a planet just like our own! 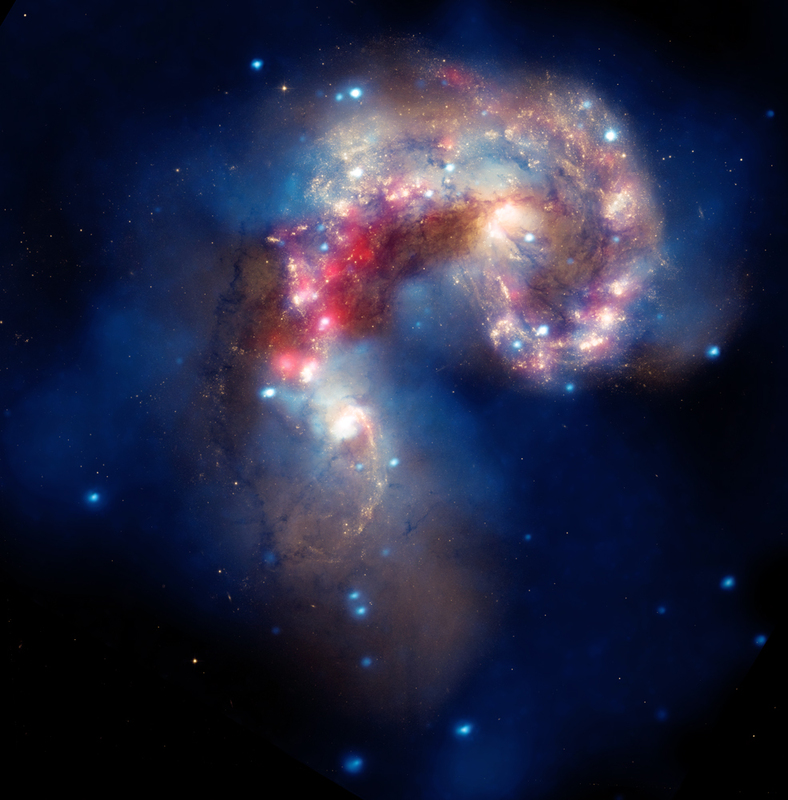 This beautiful, high definition picture via Hubble Space Telescope shows two galaxies dancing in a cosmic collision. 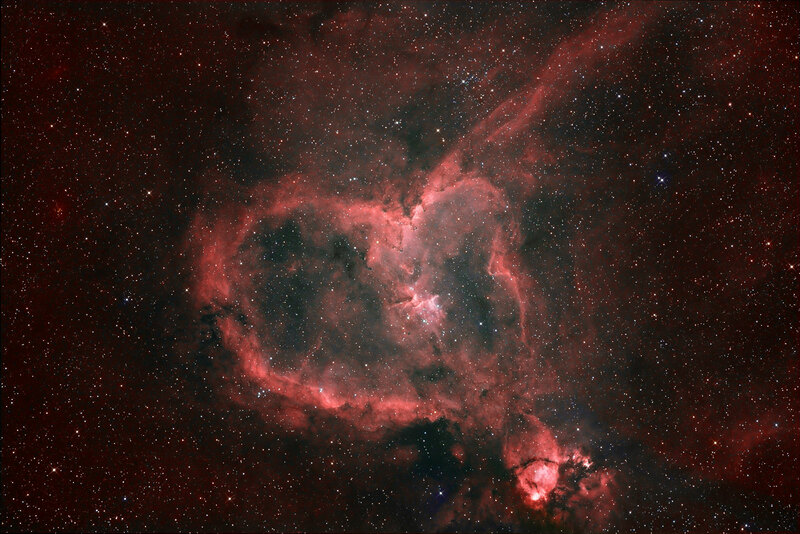 In honor of yesterday being Valentine’s Day, here is a picture of the heart nebula, a reminder that love can be found even in the deepest corners of our galaxy! 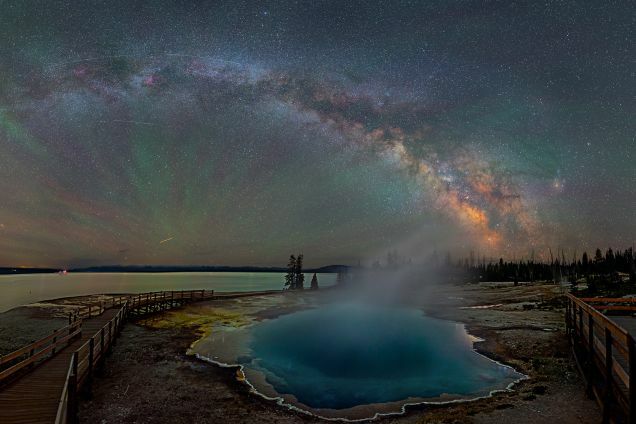 Most likely one of the most breath-taking photos of our own Milky Way Galaxy! It’s so amazing to live in a time when these photos can be taken! This beautiful image is not only breathtaking but also very important. When looking closely at the sun, their are two or three dots, which represent sun spots. These are regions on the Sun that are cooler compared to their surrounding. 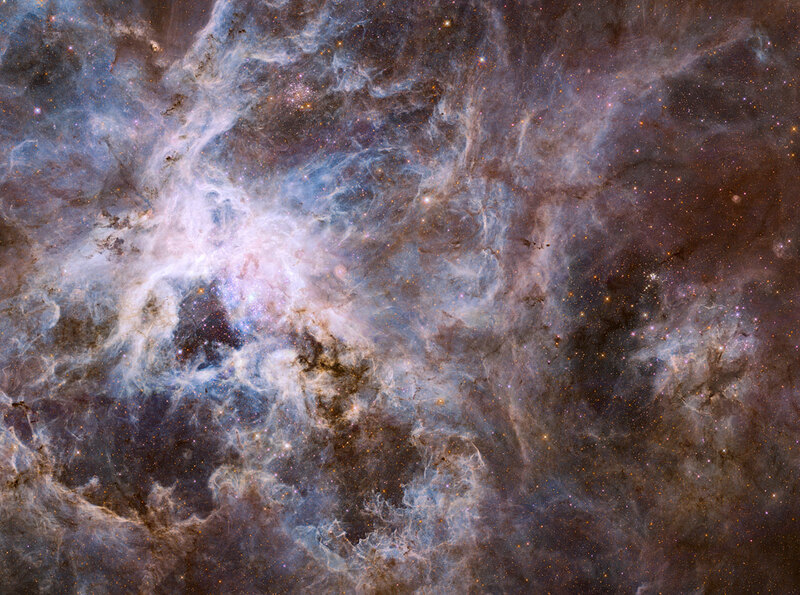 The Tarantula Nebula is the most active star nursery in the night sky. Its beautiful colors and great brightness makes it a stunning structure to be seen through a telescope. This picture was taken by none other than the Hubble Space Telescope. This is one of my all-time favorite photos. You see that little blue dot on the lower right side? That’s earth. 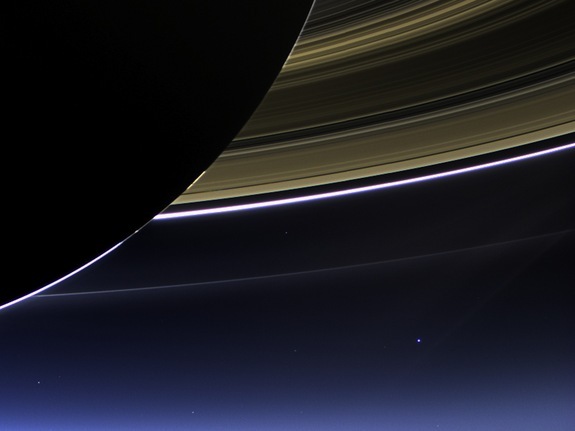 Taken by the Cassini spacecraft next to Saturn, this photo truly shows how tiny we are in this vast universe. That is why we must cherish our small oasis and protect it for future generations. 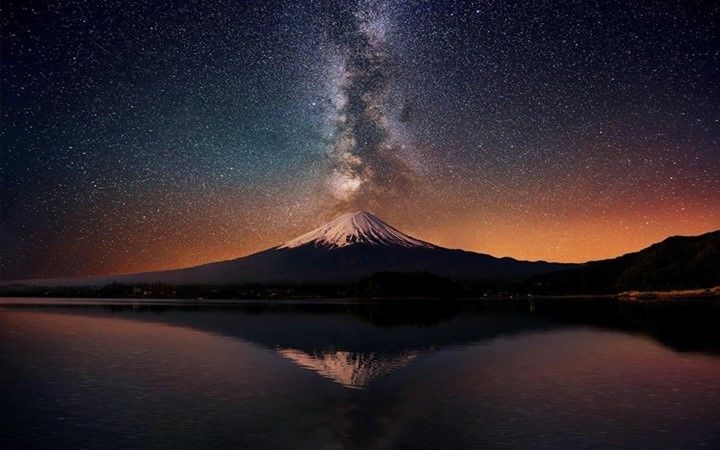 This is beautiful picture showing the Milky Way “erupting” from a volcano! 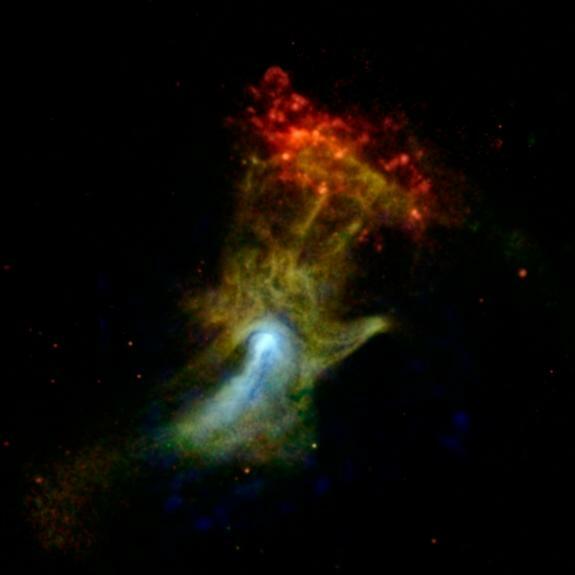 This picture recently discovered by the Chandra Telescope and NuSTAR closely resembles a hand reaching out from the night sky…Very poetic! Even more poetic is the name it has been given, The Hand Of God. Who would of thought astronomy and religion would ever mix? It formed from the remnants of supernova. Within the hand is a pulsar star spinning 7 times a second! 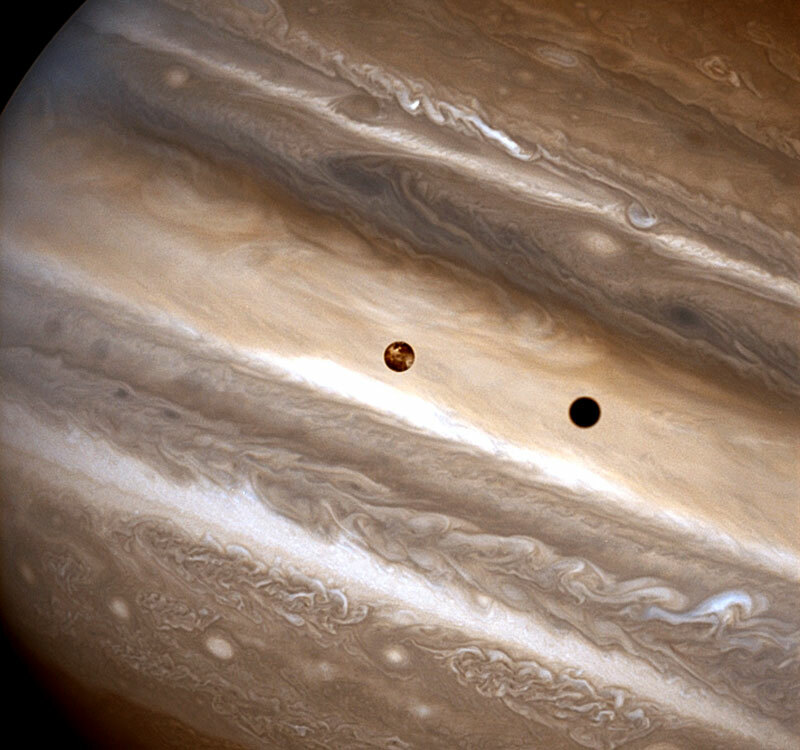 In recognition of Jupiter in opposition tonight, I present to you Jupiter! That black dot appears to be a second moon, but it’s only the shadow of the red moon. 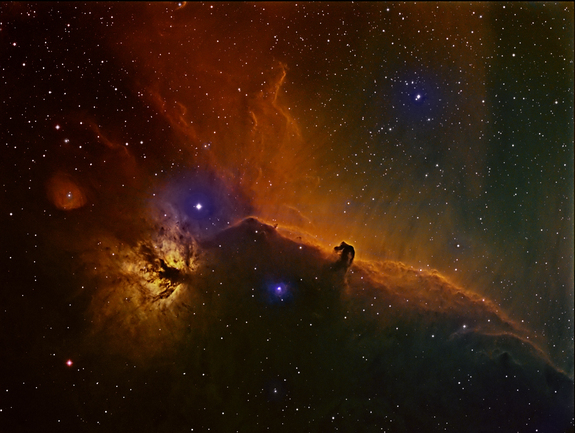 On November 28th, 2013, this image was captured of the Horsehead nebula “ambling” with the Flame nebula. The combination of these two nebulas, both around 1,500 light years away, paints a unique, easily identifiable image in the night sky. Point your telescope towards the constellation, Orion, and you should be able to identify the nebulas. 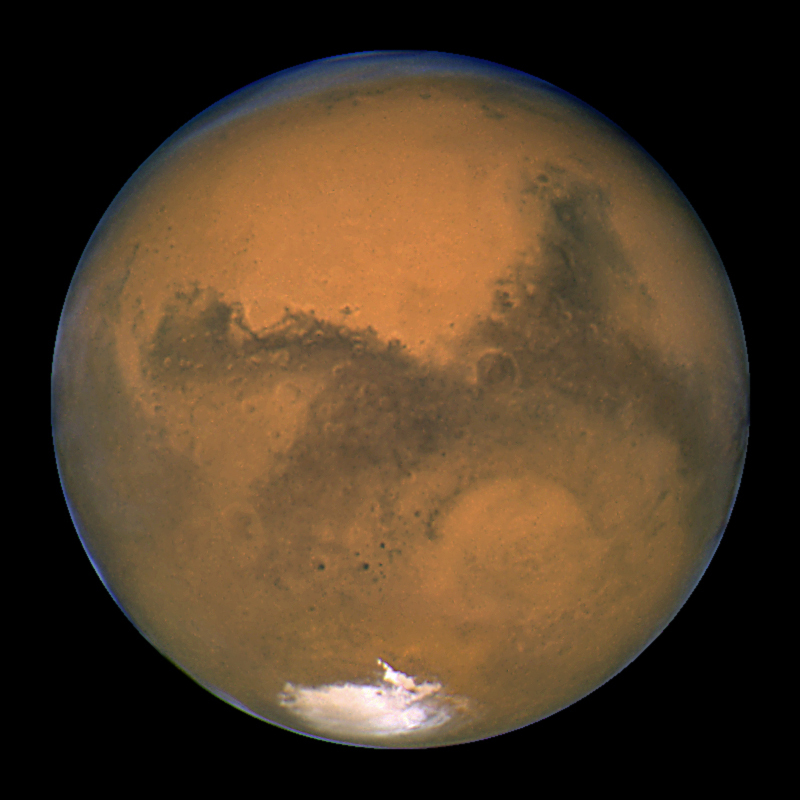 In honor of the decade anniversary of the Mars rover mission landing, here is a beautiful photo of the planet taken by none other than the Hubble Space Telescope.